The Riviera Nayarit and Puerto Vallarta attended the American Airlines Vacations’ trade shows in Texas; in Missouri, both destinations hosted a Dinner Seminar to promote the new airlift from that region. The Riviera Nayarit Convention and Visitors Bureau’s Sales and Promotions department and its counterpart at the Puerto Vallarta Tourism Trust (Fidetur) completed several important workshops in order to update 390 travel agents in the United States. These activities were held with the participation of 12 regional hotels, which took advantage of these showcases in order to reveal what’s new for the upcoming Summer Season. After a few years’ hiatus, the American Airlines Vacations’ trade shows are on once again; these are events are organized by the airline for travel agents. Both the Riviera Nayarit and Puerto Vallarta were present at this return engagement. 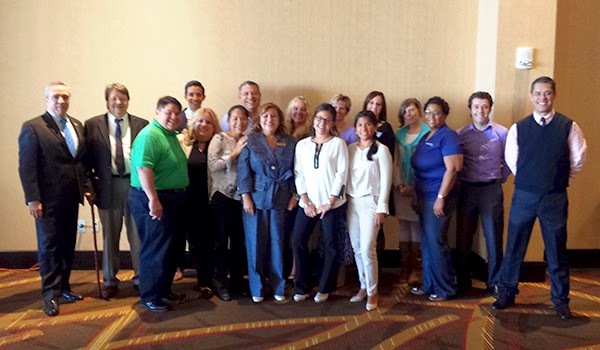 The first event took place on April 20th in Arlington, Texas, with the participation of 100 travel agents. On April 21st another 200 travel agents attended the event held in Dallas. On April 22nd the Riviera Nayarit and Puerto Vallarta hosted a Dinner Seminar for 90 travel agents in St. Louis, Missouri. The main purpose of the event was to promote the new airlift launched jointly by Apple Vacations and Funjet Vacations from this city, which is ready to kick off the Summer Season. This flight is in addition to the regular flights departing from St. Louis that both companies already have in place. Wholesaler Delta/MLT Vacations was also on the agenda; this company does not have direct flights, however, they widely promote the region via connecting flights. The event was a complete success. As part of the traditional incentives handed out to agents for their attendance and support, both Apple and Funjet raffled off two free tickets on the new flight along with accommodations in hotels, one in the Riviera Nayarit and the other in Puerto Vallarta.